There are three trails within one, you may choose a one mile, two mile, or three and a half mile loop. The first map below shows the first two miles. The second map includes the third mile but since this trail is being slightly changed this year a final map is not yet complete. The third mile is the Sugar Maple Trail that was added in 2015. We also consider the Roverud Park and Trollskogen Park as part of our system, but these sites are not established trails on our map. Roverud and Trollskogen are part of the City of Spring Grove Park system. 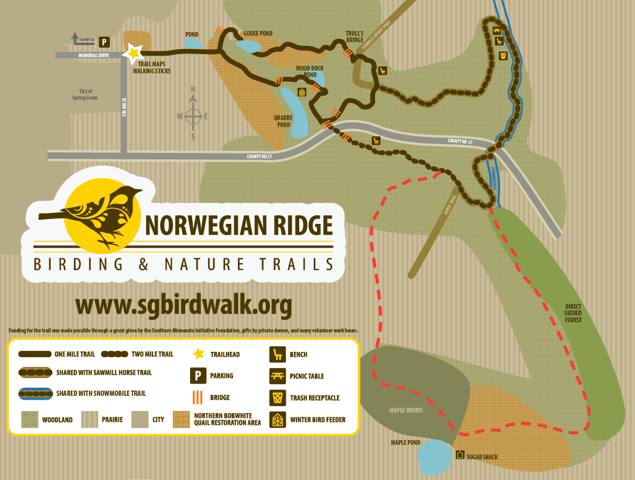 The trail is two miles and includes the 1 mile Gå På Tur and an additional mile was added to create the original Norwegian Ridge Birding and Nature Trail in 2013. 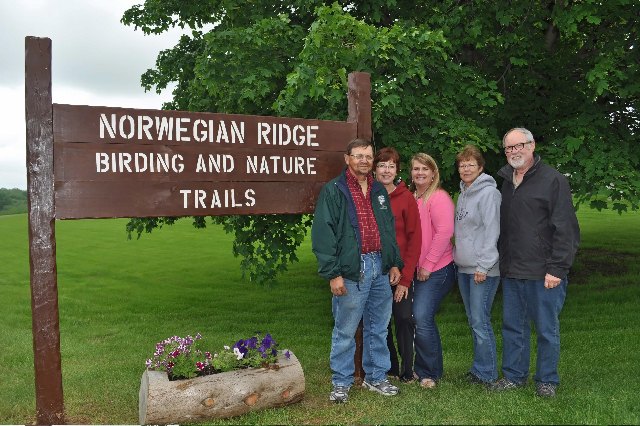 In 2015 the Sugar Maple Trail was opened for further enjoyment. You can choose to walk 1, 2 or 3.5 miles. This trail is on the east side of Spring Grove, Minnesota and is marked with the trailhead sign shown here. You enter the trail between Red's IGA and Gundersen Clinic. Here is our trail map. The map is placed at the first intersection at the beginning of the trail. You must walk past the trail head and around 300 yards down the trail you will find this map.